Olene is a jasmine bomb, with a sillage so nuclear that it would melt the olfactory glands of jasmine-phobes within 10 metres of its wearer. It doesn’t apologise for straight up punching you in the face with indolic fervour, nor does it care that you’re probably being smothered by a million tiny white flowers waving their petals like protesters would at a riotous revolution. As Tania Sanchez described, it is “death by Jasmine”. Thankfully, I like heady jasmine fragrances. Elizabeth Taylor – Gardenia + Happy New Year! Elizabeth Taylor‘s fragrances are a common staple of the TJ Maxxes and Marshalls of the world; in other words, their target audience isn’t the fancy dandy who pays an exorbitant amount of money for a pretentious cocktail at a speakeasy, or the trophy wife whose job involves checking out the latest Hermès scarves (no harm intended if you’re one such person, heaven knows I daydream all the time about being able to have champagne daily while having a personal assistant attend to me as I casually shop at Chanel – fine, I’m kidding, I’ve never harbored such illusions of grandeur, despite spending far too much on fragrance, which my mum deems “impractical” – or wait, do I? ), but bargain hunters like myself, who excitedly pop into every discounter they see in the hopes of discovering that cheapie that will turn out to be a treasure. Case in point – over the past week I must have been into at least 10 of such establishments, some more than twice, in the hopes of scoring that elusive deal. After the astoundingly uninspired and unoriginal duo of Bamboo Harmony and Water Calligraphy (insipid, watered-down, semi-floral nothingness – if you own a bottle you should pour away the juice and use the bottle as a flower vase instead) were released at the launch of By Kilian‘s Asian Tales line, and after the pleasant but still rather non-descript Flower of Immortality (Immortal? Really? The osmanthus-peach accord fades after an hour on skin), I had to steel myself before spraying on the latest release, Imperial Tea, while paying a visit to the By Kilian counter at Harvey Nichols London. You see, as someone who comes from Singapore, and who thus has lived in Asia for over twenty years, I take offence at the reductionistic view that Asia smells… boring, a view that is probably held by the messrs who create ‘Asian-inspired’ perfumes based on the to some extent true assumption that many East Asians prefer clean, fresh smells à la L’Eau d’Issey. Never mind that Asia consists of far more countries than China – I suppose By Kilian was trying to appeal to the burgeoning bourgeoisie in China, who have mountains of 元 to spare with nowhere else to spend it. However, despite China’s increasing importance in the global sphere, it is a mistake to think that the olfactory palette of, and consequently olfactory inspiration derived from an entire country can be reduced to a few bamboo sticks and water, for goodness’ sake! How would you like if I created a line called ‘Western Tales’ and proceeded to bottle the smell of a Big Mac from McDonalds, because, well, that’s what I think the West smells like? In fact, if one really wanted to capture the smell of China, the best representation of it would be the pollutive smog that blankets the whole of Beijing. Now that would be a work of art – pollution in a bottle! An allergen-free, fresh, suave cologne for the whole family. 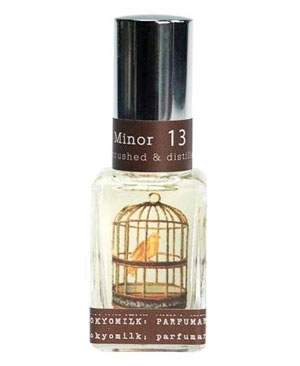 The floral opening blends white neroli and jasmine with fruity notes of yellow mandarin. Aloe vera and agave leaves add an aquatic, vegetal softness to the fragrance, which evolves towards a soft, comfortable woody musky base, for a “cocoon” effect. I’ll give Phaedon credit for accurate ad copy (well, I don’t have the tools to check for allergens, but I’ll let you know if I do develop a rash) – L’Eau de Phaedon is what the ad copy says it is. 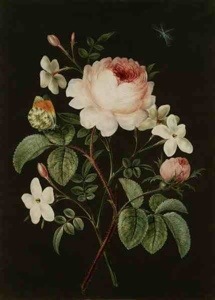 That said, if I had to sum it up in one phrase, it would have to be “cotten/linen-esque room spray”. L’Eau de Phaedon is boring. I don’t see how it can offend anyone, unless you’re the sort who’s offended by boring things. 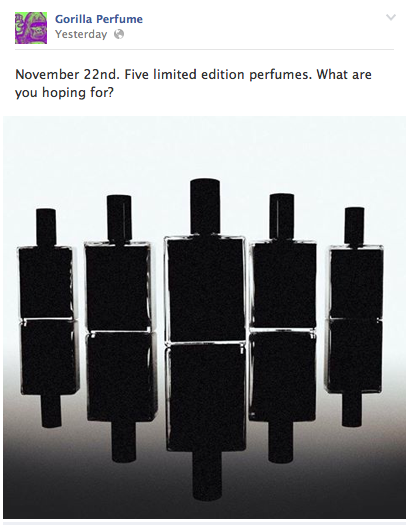 Gorilla Perfume (perfume off-shoot of Lush) has just announced on their Facebook page that they will be releasing five limited edition perfumes on 22nd November. If you’re a fan of Gorilla Perfume, you’ll probably have heard of their limited edition releases, which are usually available online only, and for a very short amount of time. Most of the time, these limited edition perfumes take the scent of a Lush product and turn it into a fine fragrance.